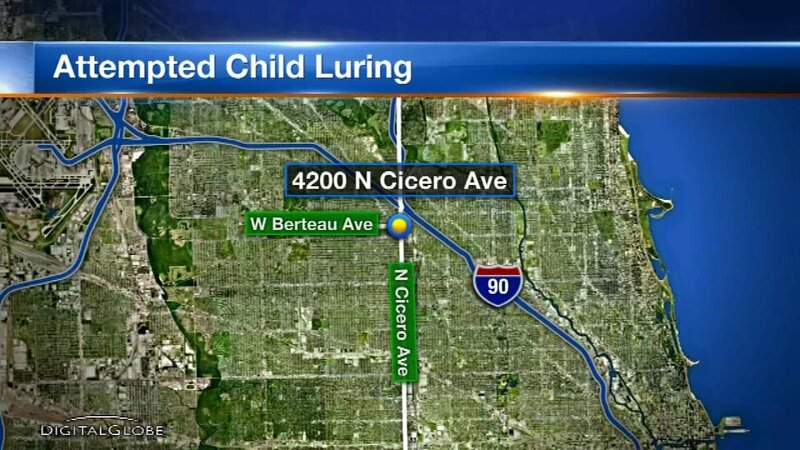 CHICAGO (WLS) -- A man attempted to lure a 14-year-old girl to his home as she was getting off a CTA bus on the city's Northwest Side, police said. At about 5:30 p.m. Monday, the girl was walking home in the 4200-block of North Cicero when the man began following her and asking her many questions. The girl continued to walk away, but the man continued to follow her and ask for her number, telling her that she can get to know him and come to his house, police said. The girl went to a nearby McDonald's restaurant to call her mother. The man stayed outside the restaurant, gesturing for her to come to him. The girl notified her aunt, who called 911. The girl reports that she had seen the offender on two other occasions last year. The man is described as being white and between the ages of 25 and 30 years old, 5-feet-6-inches tall, weighing 140 pounds. The man was wearing a Cubs baseball cap, white T-shirt and blue baggy sweatpants.